Big, bold numbers brilliantly packaged into a sleek four-door saloon. That's the Tesla Model S. The biggest battery option, for instance, is bonkers. 85KWh of lithium-ion goodness is by far the largest we've ever seen and it translates into massively the longest range yet for an electric car, 310 miles. Then there's the 416bhp of power, the 2,100kg kerb weight and the monster 17-inch touchscreen display. In fact, just about the only number to buck the bigness trend is the piffling 4.4 seconds the Model S takes to warp-jump to 60mph. It's no surprise, then, to find the list price will be an equally beefy £85,000 for the big battery model when UK deliveries start next year. Electric cars do instant torque but even that knowledge can't prepare you for the Tesla's staggering in-your-face thrust at the merest flex of a foot. Or how an advanced lithium-electric powertrain hard-wires you into the driving experience. There's no lag, no pause for breath from a combustion engine. It's a man-machine mind meld unlike any you've experienced before. Likewise, anyone who thinks electric cars aren't fun to drive hasn't driven a Tesla. Thanks to the battery packaging, the centre of gravity is silly low. That means super-flat cornering. The Model S is rear-drive, too. Toggle off the traction control to switch on the next-gen hooligan antics. The massive lithium battery pack dominates the Model S's spec list. But not the car itself. That's because Tesla has cleverly squeezed the whole shebang into the floorplan. That gives the Tesla S's interior a surprisingly airy and open feel. There's no transmission tunnel, you see. Not that you'll notice as you step on board. It's the huge 17-inch touchscreen that hooks into your consciousness at first. But eventually you'll appreciate the open and airy cabin and oodles of luggage space thanks to boots front and rear. Yup, front and rear. There's no oil-burning engine, after all. That said, if the Model S does have a shortcoming, it's that some of the fixtures and fittings don't entirely tally with the £85,000 price tag. Zero to 60mph in four seconds. 85kWh of warp-drive lithium kit. A world-beating 310-mile range. That's just the beginning of the Tesla's terrific tally of tech. Another showpiece feature is the 17-inch capacitive touchscreen system. At first, it looks ridiculous, as though Tesla has shoe-horned a PC monitor into the dash. But it doesn't just work. It might be the best in-car multimedia system ever. The nav solution combining Google maps with turn-by-turn in the driver's instruments is absolutely awesome. There's also a web browser, full media playback and touch controls for everything from the suspension to the sunroof. Then there's the rather natty smartphone app giving you remote access to charging, climate control and more. Speaking of charging, the time taken can vary from as little as an hour with one of Tesla's own 'superchargers' to as much as 30 hours using a standard domestic socket. The combination of massive 17-inch capacitive touchscreen and a second display for the driver's instruments makes for the best satnav system we've ever seen. Tesla has cleverly squeezed the huge 85kWh battery into the the chassis floor. That makes for both super-flat cornering and an airy, open-plan cabin. The Model S will suckle on almost any electrical supply, which is great. Using a standard domestic socket, a full charge takes around 30 hours, which is less great. A 300-mile range, phenomenal performance and handling and some of the best in-car tech we've ever seen. 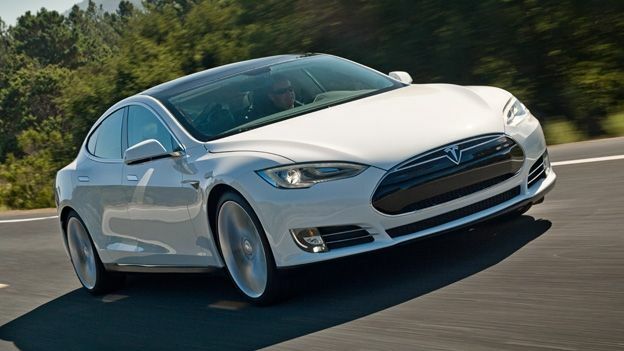 The Tesla Model S doesn't just explode preconceptions about electric cars. It makes conventional combustion cars seem so last century. OK, it's far from perfect. It's not cheap. The interior could do with a quality upgrade. And even with a 300-mile range, the Model S can't quite be used like a conventional car. But for most people, most of the time, this feels like the future of motoring.